The Krate, Kar-Tunn, TRUNDLE, Mitten, and the Stumpy are all small, affordable frames in a market clogged with oversized, overbuilt, piles of expensive parts. ;-) I could possibly include A YATES INDUSTRIALS may even be getting involved with his TUBs, but there's no trash talking coming from him. Zerovirus has joined the fray with the Rumple. Even Soren is getting in on the action, with something a little more Ijad looking! C'mon, join us on the bandwagon, it's fun! There's also a "clearinghouse" topic on the Hangar. You can't tell the players if you don't have a program. Blorf and MRaichelson were in Massachusetts for assorted reasons and managed to meet up with some of the usual suspects at the Hobby Bunker in Malden, MA for a game of Mobile Frame Zero: Rapid Attack. These are the results. MRaichelson (5 frames & 19 systems) = (7 points per asset) * (7 assets) = 49 points. Me (5 frames & 20 systems) = (6 Points per asset) * (7 assets) = 42 points. Blorf (6 frames & 23 systems) = (4 points per asset) * (8 assets) = 32 points. Here's the board layout at the start of the game. I started out near MRaichelson on the left side of the table. Tom and Blorf started at opposite corners of the right side of the table. A lot of posturing and movement by all players. I attacked MRaichelson, Blorf attacked MRaichelson, and Tom attacked Blorf. No frames were destroyed but several were damaged. One of my frames was reduced to just white dice after a strike from Blorf's HtH specialist frame. The heat was turned up in this round as MRaichelson lost a frame and a station to me. I then lost one of my frames. Blorf and Tom also jockeyed for position. End of Turn 3 pictures. Things went from bad to worse. I lost another frame but captured one of MRaichelson's stations. MRaichelson also lost another station to Tom. On top of that he lost two frames. Tom and Blorf got into a dust-up over Blorf's stations but no frames were lost over them. Blorf clicked the DDC down to 1 and I decided to click it down to 0 because I couldn't see a quick way to win and we were running out of time. Here were the stations that were most contested. This was a hard fought game and I believe Blorf said, "You guys have made me think more about this game than any other I've played." We used Environmental Systems for this game. The Blue felt areas were considered water and you needed an Environmental system to operate fully within them. The Environmental Systems ended up not having that much impact on the game that we could see. We also switched from full buildings to partial walls for this game. It was pretty satisfying seeing all the broken terrain at the end of the game. The Hobby Bunker is a good location for a game. We'd be willing to go back if any of the Eastern Massachusetts MoF0s would be interested in a game. Hint, hint. There were several people who came over and took a look at the game while we were playing. A few expressed interest, including a couple of store employees. It was great meeting Blorf again, and MRaichelson for the first time. It was also great getting to game with both of them. Bag. MSRP is $4.99 which leads to a $0.10 Price per Piece. Parts. Mixel joints, Studless Slopes, Cheese Slopes a tooth plate, Robot Arms, Mod. Plates w/Vert. Arm, 2x1-2x2 Brackets, 1x2 Inverted Slopes, New Headlight Bricks, 4x3 Studless Wedge, 2x4 Flared Wing Mudguard, two Starfish, the Slope 2x1 Double/Inverted, and the funky Wedge 4x3 Cut Back w/Cutout & 2 Studs are all cool parts. There's just not enough of any of them. Build. I'm calling this the Lime Rhino. Score: +5 (B+). This set ties with the Mixel Flurr set for lowest scoring Mixel set. is the big standout for me. Clips, and an Octagonal Bar Plate are just some of the good bits. w/Vert. Bar, Gears, new Technic Helicopter Blades, etc. Parts 4. More small parts. Lots of Technic Pins and Connectors, two Technic Bricks, two new Headlight Bricks, two Lampholders, two 1x1 Trans-Red Cones, and three Minifig Sais. Build 1. Frame, naked for ease of build. Build 2. Frigate. Stats: 2Ra+d8/1Y/1Gd8/2W. Score: +15 (A). Full of interesting parts but it will still take a little skill to make this collection of parts into something worth putting on to the table. After a day off for the holiday, let's keep going with the Tan Mixel tribe. Parts. The Technic Bricks are nice as are the Bricks w/Studs on one side. More Bar Holders w/Clip, Half Bows, Cheese Slopes, 1x2 and 2x1 Plates w/Bar (closed ends), Clip Plates, Friction Pins, Half Pin w/Towball, 1x2 Plate w/Towball Socket, Lampholder, 1x2-2x2 Brackets, Inverted 2x4 Slope Double, a Tooth Plate, multiple Small Barbs, and a few Large Barbs all look interesting. Build. I went with something a little different this time. (fore smoke launchers)/ Gd8 (multiple legs)/ 2W. Score: +20 (A+). Another top scoring Mixels set. Here's the first review for the Series 3 Tan Mixels. Parts.Plenty of Tan and Dark Tan here. Cheese Slopes, Mixel joints, Mod. Plate w/Bar (angled), Bar Holder w/Clip, and some Slopes -- regular and inverted -- plates, 2x2 Jumper plates, a couple of new Headlight bricks, and some Clip Bricks. Looks like a good selection. lunch the other day. It even has its own station. 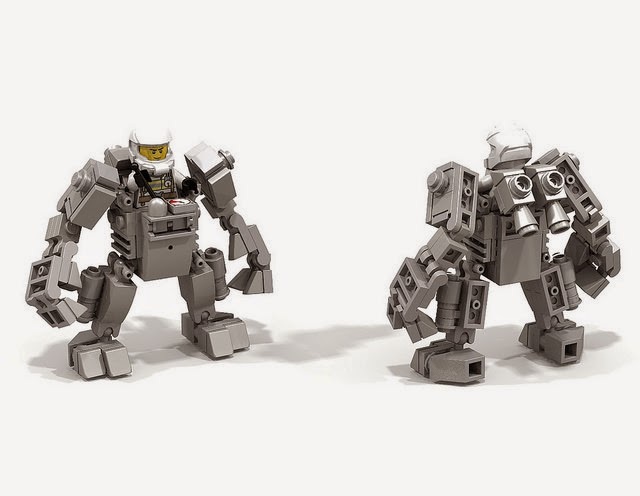 Atomic Bricks on Flickr has started a Kickstarter to raise money towards creating a mold for these designs so they can be made in ABS plastic. 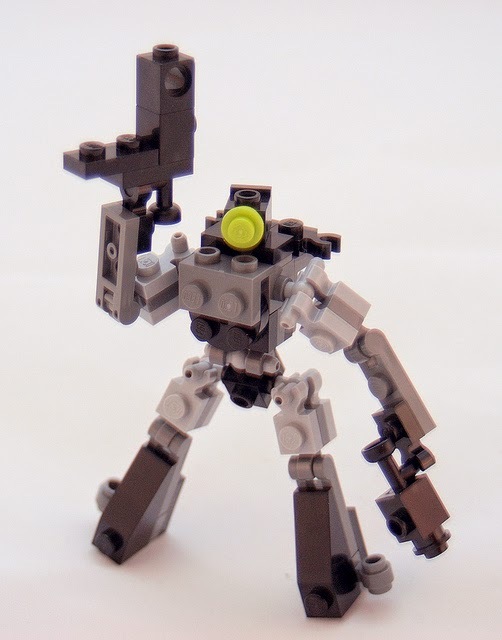 Now I'm generally not a fan of using minifig-scale weapons for MFZ but, I'm always a sucker for minifig shields and some of those weapons look pretty good. Here's a some mecha to get you over the mid-week hump. with a head and this could make an interesting frame. nice. I think a squad of these guys would be pretty affordable. He even has a set of weapons to go along with it. like a riff on other designs we've seen. 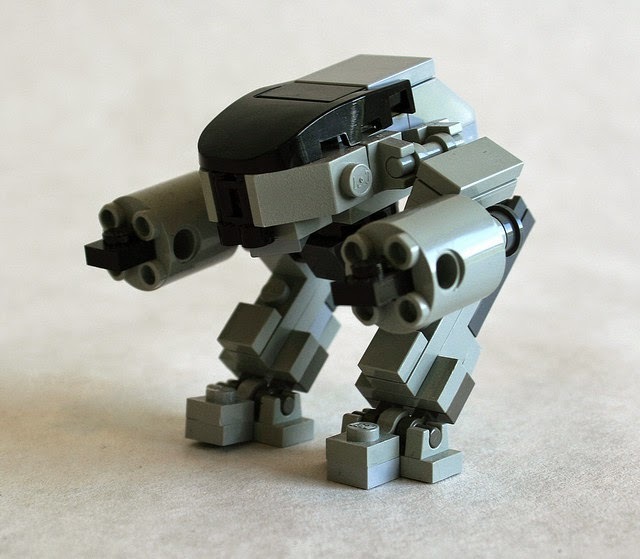 ED-209 by Angus MacLane. Yup. 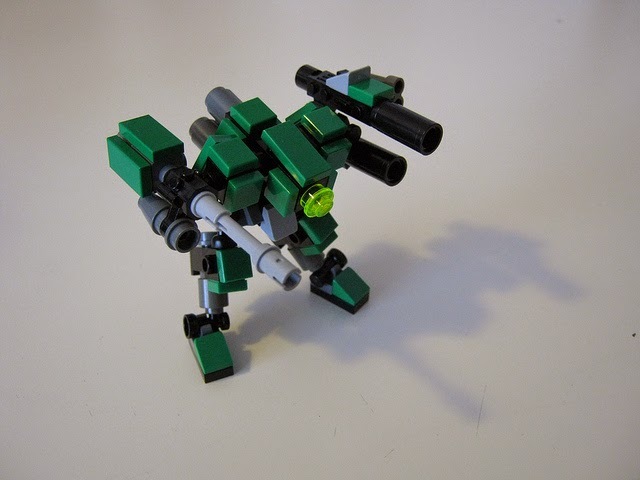 variation on Ironsniper's Hammerhead mech. 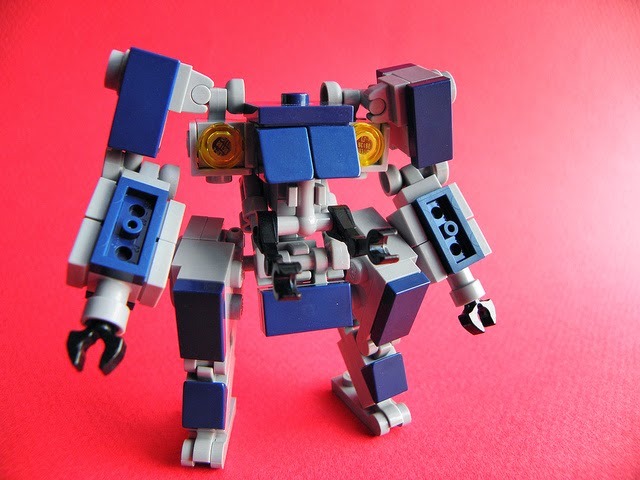 We have another entry to the MFZ Blogosphere. Cheap MFZ is a blog dedicated to Single Set Challenges and cheap Lego. That's a pretty nice combination. Please join me in welcoming him to the community. Let's continue Series 3 with one of the purple sets. Build. I'm going to swing back to the kaiju stylings from creations from the last set of Mixel reviews for this build. Stats: 2Rh+d8/1B/2W. I'm starting my run on the Series 3 Mixels. Yes, I know these are late. Parts.Mixel joints, Lampholders, Half Bows, Cheese Slopes, Clip Plates (Horiz. ), Tooth Tiles, Bar Plates (closed ends) -- 1x2 and 2x1 -- and a 1x2-1x2 bracket are just some of the useful parts I see. (grabber arms) 2Y (sensor fangs) 2W. Part of the last wave of Chima sets, this is an army builder pack. Box. MSRP is $9.99 for a Price per Piece of $0.14. Ouch. Parts 1. Cheese Slopes, Clip Plates (vert. ), Lightsaber handles, 1x2 Technic Bricks, a Teeth Plate, 1x1 Round Plates, 1x1 and 2x2 Round Tiles, Minifig Claws, and a shooting Minifig Gun are just some of the fun parts here. Parts 2. Other people have done some interesting things with the banners from these sets. The Skis are interesting too. Build. Nothing. Whatever I tried came out looking like a pile of parts. Score: -5 (B-). Yeah, get these on sale or Clearance if you can.